Going through old photographs, I found one of my favorites from 1984, taken just a month or so after I arrived in Colombia. I don't know the name of the genus or species. It's a jumping spider (fam. SALTICIDAE). Many of the Colombian jumping spiders were flamboyantly colorful, but this gal relied purely on personality. Today, with digital cameras, I can shoot 200 quick poses and pick the one I like best. In those days, shooting on film, every shot had to try and be the best. I think this one has stood the test of time. Sunday, we put the newlyweds on an airplane back to Brazil, where they will make their life together. In 1984, when I was getting ready to take my family to South America for a two-year hitch, God impressed upon me the fact that if it was a good experience, I would spend my life putting my children on airplanes and saying goodbye. Colombia was a good experience. The two years stretched to nine, and each of my children caught the bug. Once, several summers ago, I had one or more of my children on each of four continents, simultaneously, and each child involved in something good. But airports, and saying goodbye, are always hard. In helping to put together a video for the wedding, I found this picture of the future bride, at nine, when I put her on a plane to go back to the States for her grandmother’s funeral. On flight days, the tradition at our little airport was for the whole community to come down to the hangar for goodbyes. 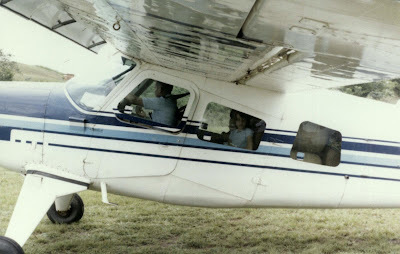 Then, once the passengers had boarded, a contingent of well-wishers would hop on our motorcycles and race to the end of the airstrip to wave a final goodbye as the plane lifted off. Lomalinda was a Bible-translation center, an intensely close community, but its members rotated in and away on a constant basis. Saturday, we had all five of our chicks together at my son and daughter-in-law’s apartment for the evening, along with our grandson and our new son-in-law. My daughter-in-law had prepared a scrumptious meal. It took expanding their dining-room table, adding a card table, and then whopper-jawing the combination diagonally across the living-room, but we got all ten of us seated for a meal. Throughout this six-week Christmas-and-wedding season, we have had them together often, in various combinations. We are an intensely close family, but our members rotate in and away on a constant basis. At LAX, we hugged the newlyweds goodbye outside the Transportation Safety Administration checkpoint, a full hour before their flight. We could see one portion of the TSA room if we stood in just the right place, but the newlyweds were directed into the line just out of our view. Eldest Daughter gave us a quick, furtive wave. We walked back to the car and attempted to drive to the end of the runway, the same beach to which we went on our first date, almost thirty-seven years ago. Getting around the airport was easier in the pre-9-11 days, but a major storm was also coming in and we had 200 miles to drive home. Three days earlier, the previous storm had closed the pass with snow. Giant waves crashed against the beach, and big drops began to splat against the windshield. Because of the storm, airplanes had reversed their approach and take-off patterns, so that now they were landing over our heads and taking off at the other end. We headed for home. With a twelve-hour layover in Rio, the newlyweds took thirty-six hours to arrive, but they got home safely. We did, too. For the last hundred miles, we were even out in front of the storm. I’m proud of what my children are doing with their lives, but the goodbyes are never easy. I’m glad that twenty-four years ago, God gave me a glimpse of the future, and had me make a decision. In choosing to be obedient to Him then, this was the price I was willing to pay. I’m still willing. I am proud of what my children are doing with their lives. Thirty-five years ago this afternoon, I waited across the street from the high school where Vicki was teaching. After school let out, I talked a custodian into opening her classroom so I could sneak a bouquet of yellow gladiolas onto her desk. (She went to school the next morning determined to not let the students know that anything special had transpired the previous evening. The gladiolas squashed any chance of that.) Then I went to an Italian restaurant in Monterey Park and had them put a long-stemmed rose in the walk-in refrigerator, with instructions for the waiter to bring it to the table. After dinner, I knew a church that would be open but empty. We walked up the long aisle and knelt at the altar. We prayed together for a while, and then I surprised her. She knew I was going to ask her, but she didn’t expect me to ask her there. Later, outside, she wanted me to ask her again, because she hadn’t thought it would be appropriate for us to kiss at the altar. We took care of that. Tonight we celebrated by going to a school board meeting. Vicki had a presentation to make. We sat in the second row, and I put my arm around her while we sat through a long list of other presentations. Then we came home, and once again I asked her to marry me. It’s our annual tradition, but every year she acts surprised. She thinks about it for a minute, and then agrees. After thirty-six repetitions, it’s still a nice tradition. Yesterday, I took my daughter and son-in-law up to Kings Canyon to see the General Grant tree before they take off for Brazil. At the point when I realized I had gone too far before putting chains on the tires, I stopped and was about to get out when a movement at two-o'clock high caught my attention. I now suspect this is a coyote, but at the time is was coming down the mountainside, full-speed, straight at me, I was thinking, 'Wolf!' It came around to the driver's side of the van, and waited for me to get out. I decided maybe I wouldn't. Instead, I inched along, curving around several bends in the road, while my canine friend trotted beside us. Eventually, he (she?) got bored with us, I did get the chains on, and we did see the General Grant Tree. A good time was had by all. I am still thinking through the proposal—recently endorsed by Gov. Huckabee—to require (within 120 days)all (say, 12 to 16 million) illegal aliens to return to their country of origin and go to the back of the line to await immigration and green cards. (Total disclosure: one Brazilian son-in-law and one Chinese soon-to-be daughter-in-law could eventually be waiting in those same lines.) Unfortunately, it throws into doubt my whole opinion of Huckabee, and has me taking a more careful look at John McCain. Yesterday I mentioned the havoc we could expect in our already-depressed housing and banking sectors if all those people were forced to default on their mortgages or leases, or move out of their rentals. Added to that, I’m trying to decide whether all those (and by definition, if we use the term illegal, we are already calling them outlaws) with auto loans would politely park their cars back at the dealerships, or use their cars to drive back across the border. I am reminded of an answer Mao Tse-tung gave when asked how China would respond to an invasion from the Soviet Union. “On the first day,” said Mao, “We would surrender 100,000,000 people. On the second day, we would surrender 200,000,000 people. On the third day we would surrender 300,000,000 people. On the fourth day, Russia would give up.” Is Sears ready to repossess even 100,000 refrigerators and washing machines? Anyone calling for the 120-day removal of 12 to 16 million members of our economy is thinking in terms of faceless numbers, and not people. When I think of individual people whom I have known and yet who fall within that statistic, one that comes to mind is Araceli, a junior high student I had in the early 80’s. For class, she wrote me an essay about being smuggled back into the U.S. after a Christmas trip to visit her grandparents in Mexico. Her parents owned (I’m sure in cooperation with a bank) a home. She had been in U.S. schools since kindergarten. After high school, she earned a license to work in elder-care, and the last time I saw her (18 years ago), she was working in a large assisted-living facility. She would now be forty-something, a productive member of our society, and (on 120 day’s notice!) sent back to live in a country she has only visited for Christmas. Who will replace her at the elder-care facility? Will adding her house to the over-supply of unsold houses help our economy? Which country will benefit most from using the skills we paid to educate her with? Multiply that 12 or 16 million times and we are talking about a self-inflicted Katrina. So let’s examine the scarlet lettered A-word: Amnesty. When are amnesties appropriate? And when do they fail? Between 1862 and 1872, the United States under Presidents Lincoln, Johnson, and Grant offered ten separate amnesties, the first targeted to tempt active rebel soldiers back to the Union, and the last to return full citizenship to even the most high ranking former Confederates. Today, almost everyone would accept the wisdom of those amnesties, even where men had actually taken up military arms against the federal government. We’ll call that a success. For nine years, I lived in Colombia, South America. While there, I taught Colombian history, a history marked by nearly continuous armed rebellions for almost the entire past 200 years. Amnesty is simply a part of their cycle. As generations of middle aged rebels become tired of the life of war, they accept an amnesty and a plot of government land, and a new generation of rebels takes up the warfare. We’ll call that a failure. The difference is that the successful amnesty did not encourage a new infusion of individuals into an activity the government hoped to curtail. For an immigration amnesty to work, the United States has to have a solid fence. But once we have that fence, we ought to make every effort to make citizens of the people who are actually here. The nice thing about politics is that once someone (a blogger, for example) has publicly declared themselves as a supporter, there is always the possibility for egg on the face when that candidate swerves one way or the other. Over the last week, it would seem that Mike Huckabee has moved more in the direction of being “tough” on immigration. I find that unfortunate. One of the things I found appealing about Huckabee in the first place was that he seemed more moderate than some of the other candidates for the nomination. As mentioned previously (even in another post today), I have been a serious student of movements and migrations of people for forty years. Oftentimes when populations have clashed, the solutions imposed by the dominant group have backfired. For example, at the very time Spain and Portugal were importing enormous wealth from the New World, they expelled all the Jews and Muslims from Iberia. Only later did it become obvious that they had eliminated entire segments of their economy. Most of that gold and silver wound up in the hands of merchants in Holland. Spain and Portugal went from world-class powers to also-rans. Propose to provide all illegal immigrants a 120-day window to register with the Bureau of Citizenship and Immigration Services and leave the country. Those who register and return to their home country will face no penalty if they later apply to immigrate or visit; those who do not return home will be, when caught, barred from future reentry for a period of 10 years. This is not a "touchback" provision. Those who leave this country and apply to return from their home country would go to the back of the line. So, let’s see now: At the very time when our housing market is teetering on the brink of pulling our economy into a full recession or worse, we are going to take 16 million people who are currently either renting or making payments on houses, and we are going to send them away, throwing those additional houses into foreclosure and further aggravating a situation where too many houses are sitting empty. We are going to suddenly reduce school enrollments—midyear—thereby throwing school districts into situations where they cannot fulfill contracts to their teachers. Etc. I've listed only the first two that come to mind. Yes, we ought to build a secure fence. Yes, we should cut off the flow of new crossings. But before we send all of them home, let's recognize that these people are CURRENTLY integrated into our economy. The process to change that is called disintegration. Why would we want to apply the process of disintegration to our economy, and on a 120 day deadline? I recall a program on the history of Rock and Roll in which one of the greats (I remember it being Lou Rawls) was asked (in discussing the Righteous Brothers), “Can white guys have soul?” Rawls just chuckled in a way that said: That’s too silly a question to even answer. I take comfort in that, because for me, the parallel question is, “Can a white guy write ethnic literature?” I contend that if it is theoretically possible, I am a pretty likely candidate to accomplish it. Beginning in high school, I have been a serious student of immigration and the interaction of cultures—not just here, but world wide. In college, I took Japanese, tutored English in Chinatown, specialized in the history of China and Japan, and was elected an “Honorary Asian” in order to serve as a summer-camp counselor at an “all Asian” camp. Then I married into a Mexican-American family, switched to studying Spanish, and divided 28 years between living in Latin America and teaching in predominantly Mexican-American communities in California. For the ‘us’ to get bigger and the ‘them’ to get smaller, I believe there must be writers on both sides writing in the margins that currently exist between groups. By writing from within those margins, I can help introduce my friends on one side to my friends on the other side—friends who might not otherwise meet. I’ve said that Friday 10:03 is a California novel. Because California is—and always has been—a place of ethnic interaction, I believe the same must be true of any California novel. And even a white guy can do it. Going back to age 14, I have never missed a California primary. In 1964, as a reporter for the junior high newspaper, I interviewed New York Governor Nelson Rockefeller. I asked him what options were open to a person still too young to vote. He recommended studying the issues and volunteering at some candidate’s headquarters. When I was 18, a voter had to be at least 21 (as opposed to when I was 21, when a voter only needed to be 18), but even while denied the ballot in 1968, I attended primary rallies and shook hands with Eugene McCarthy, Bobby Kennedy, and—as I had four years earlier—Nelson Rockefeller. (That November, I licked envelopes at Nixon headquarters.) In 1972, I served on the UCLA committee to elect Shirley Chisholm. (Yeah, I was exploring my political identity.) 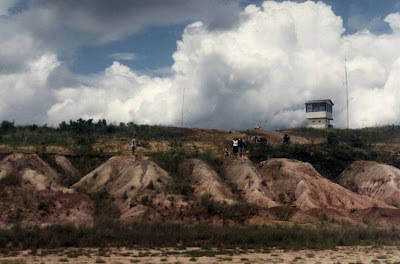 Even when I was out on the Colombian Llanos (1988, 1992), I paid attention to the campaigns, and voted by absentee ballot in the primary. So this week it was with some consternation that I woke up to the fact that the California Primary is sixteen days away—and this is happening in a year in which the California Primary will carry more weight than in any year since 1968. Yesterday, I went on line searching for a local “Committee to Elect Mike Huckabee.” At the national Huckabee Campaign Website, I found a list of states where I could potentially volunteer. The option closest to my home is Oklahoma. The closest thing I could find to a local entity was a web-based mikehuckabee group on meetup.com. I am now the eighth member of the Tulare County group, but it looks like two of the eight are organizers coming down from Clovis, and one has an address in Orange County. Beside “Our Next Meetup,” is the notation “None Scheduled.” However, newspapers reported that in Michigan, the Huckabee campaign had spent no money, hired no staff and had no office until six days before the primary. He still gathered 16% of the vote, for third place. In South Carolina, the Huckabee campaign had only a state manager and two paid staff members until about three weeks before the primary. He drew 30% and finished just behind McCain’s 33%. At this point, I’d have to call McCain the front runner (and I could happily vote for McCain in November), but I’m thinking this might be a rollicking fun sixteen days. (California Post #1) History of my novel, Friday 10:03 (Part 10): a California novel. Friday 10:03 is a California novel. It has settings in northern, southern, and central California, but all the action takes place within a nine day period in California history. I don’t want to give away my story, but I can talk about some of the settings. During the years (1970-1972) that I began writing the novel, I was studying at UCLA, working two part time jobs in the San Fernando Valley, and volunteering as an ESL tutor in Chinatown. I spent a lot of time on the freeways. At the end of 1972, I went to Europe. (The novel does have flashbacks to events in London and Paris). Then I earned my teaching credential at CSULA (1973-1975), located east of downtown. As I traveled from place to place, I collected locals for my story. Many years later, as I picked up writing again, I went back and walked some of those locations to be sure I remembered them correctly, but at least one no longer existed. In 1973, I picked up a newspaper and read that bull-dozers were scheduled to raze the last vestiges of Hicks Camp. I had read about El Monte’s farm labor camps in the writings of Carey McWilliams (see part 5). The moment I saw the paper, I knew I wanted a family in my story to live there. I had three days to see it before it disappeared forever. The reporter had interviewed a social worker at a youth center near the camp. I found the social worker and asked for a tour. I was able to go inside one of the last homes still standing, and conduct an interview with the owner. All these years later, I don’t know where the notes are that I took that day, or the photographs, or the interview tape. However, in a story characterized by careful attention to settings, that is one of two settings that most please me. The other will have to wait for this account to move ahead 32 years. I appreciate Nicole dropping by and leaving an occasional comment. A couple of times she gave me an AAAACCCCKKKK! for my spider pictures. But even my spiders seem to be better received than my recent mention of ‘social justice.’ Perhaps I’ve been using the term wrong. To me, ‘social justice’ would be a condition in which the fabric of society is just in all of its relationships. It provides a goal which will never be perfectly attained, but should always be pursued. Nicole suggests a dualism where, though Christianity requires social justice, government does not. In fact, she sees the idea of government pursuing social justice as the essence of liberalism and its end result, socialism. Certainly, on the liberal side, there are those who believe social justice is entirely the realm of government, and Christianity should be barred from any participation. I think both sides miss the point. Government and Faith-Based efforts must work hand-in-hand. Government can never be neutral. In situations in which the current fabric of society is less than just, for government to stand by and allow the status quo is to support social injustice. As a Christian wanting to live my faith with my whole self, I cannot compartmentalize myself into a faith-person who works for social justice, and a secular person who votes against it. Some Liberals would have me do the same thing, claiming that Separation of Church and State requires me to set aside my faith before I enter the polling place. I cannot do that. I am an integrated being, attempting to put Jesus Christ at the center of everything I do. Government and the Church have overlapping concerns. For example, our nation incarcerates people at a higher rate than any nation on earth, except possibly mainland China. This comes with both civil and spiritual issues. Far-and-away, the most successful programs to overcome recidivism are Faith-Based (and here I would include even Muslim programs). For various Liberal groups to oppose these is to argue that a life spent in prison is better than a life spent in religion. That is bizarre. The same is true for programs to restore lives that have been destroyed by drugs, or programs to reduce rates of adolescent pregnancy. Both the Church and the Government have vested interests in promoting literacy—equally—among all segments of our population. Education began in this country because the Church recognized that (all people being equal before God) everyone needed the skills to read the Bible for themselves. Government came along later with the realization that in a democracy, every voter needed the skills to read a newspaper. However, it is a fact in our country that children in poor neighborhoods are not born with the same realistic odds to learn to read as children born in wealthy neighborhoods. I have taught in both Church schools (where parents could afford to pay tuition), and public schools (where not all parents could send their children to school even with breakfast). I have also sent my own children to public schools that had better programs and facilities (but equally talented and dedicated teachers, struggling to make do)than the schools across town. That, to me, is a social justice problem. The short term—and then only partial—solution may be vouchers. Long term, however, we have to fix our public schools. As a school teacher, I believe our number one shortcoming in public education is that we have insufficient means for dealing with unruly students. One disruptive student reduces learning slightly. Every additional problem child reduces it geometrically. I have seen horrendous situations where parents could offer no help, and administrators had insufficient leverage. At a certain point, good kids who are trying to learn are sitting in classrooms where no learning is going on. That is a social justice issue. The solution is not moving the good kids with vouchers, but removing the disruptive kids to alternative programs. But as a democracy, we cannot accept that a troubled youngster could be written off for life at age twelve. The alternative programs cannot be dead-end programs. They must be better funded than the regular program, and with access to the best teachers. They must have meaningful carrot-and-stick incentives over both students and parents. Their goal must always be to return the student to the mainstream program, and not just move them on to adulthoods in prison. That will require major government funding. It may also require a lowering of the Church-State wall. The Church does not have the manpower to carry even the largest part of this burden, but where the Church can, government must be open to the reality that—just as with reducing recidivism—religion may have the best answers. I shan’t go on. If Nicole and I still disagree, we may have to agree to disagree. And I suppose its time for me to find another beautiful spider portrait. On average, I am 58 years old. My knees feel considerably older, while my spirit feels younger. I’m feeling even younger this evening after reading an article by David D. Kirkpatrick in the New York Times: Huckabee Splits Young Evangelicals and Old Guard. Guess what? I’m a young guy! I’ve been aware for many years that there are corners of the Republican Party where I don’t belong. My economic outlook is fairly populist, though we do have a responsibility not to spend the next generation into bankruptcy. I put a high value on social justice. On immigration and bilingualism . . . well, I’ll just point out that each of my three oldest children chose a spouse born overseas, from a non-English-speaking family, and I'm richer for it. My ties to the Republican Party are rooted in two basic issues. The first is abortion. Even ignoring that I find it morally inexcusable, abortion is not pragmatically feasible. No nation can survive by killing its children. That is especially evident in the African-American community, where abortion ends more lives than all other causes combined. As a result, too few babies are born to even replenish the existing population. Unfortunately, where the African-American community is leading, the rest of the nation is following. The second issue is a little more nebulous. In my perception, the Democratic Party assumes that I—as a parent—should function as an agent of the State in raising children who belong to the State. In contrast, at least my wing of the GOP believes that as a parent, I am a steward working on behalf of God, to whom the children belong. A third possibility is that I should be a steward raising workers and consumers to maintain the capitalist system. That may animate some Republicans, but not this one. So when Huckabee exposes fault lines in the Republican party by saying Christianity requires social justice, and the kingmakers say that makes him ‘socially liberal,’ well, then so am I. And if they accuse him (and McCain) of being soft on immigration, well, so am I. And if they’re concerned that he wasn’t born into a political dynasty, or into money, or might not protect the interests of those who were, or that he brings a decidedly Christian outlook to things, well, last year I made under $30,000, teaching at a Christian elementary school, because I thought that’s what God wanted me doing. And because I find Huckabee appealing, Kirkpatrick says that places me in a category with the young. I’ll take that assessment, no matter what age my knees feel. I don’t have strong memories of actually writing the early sections of what I was not yet calling Friday 10:03 (I won’t even let slip the previous working titles I’d given it.) I do remember doing research. I also remember meeting someone who could have appeared in the book, but doesn’t. Together, Steve and I worked as banquet waiters at UCLA. (Like so much else, he got there first, and I followed along.) One day, we were setting up the biggest hall we had for a crowd I remember at about one thousand luncheoners. We got everything set up, and enjoyed a lull while the crowd filed in. Back stage, retired Chief Justice of the Supreme Court Earl Warren was waiting to go on as keynote speaker. Warren had been Governor of California when Caryl Chessman first landed on Death Row, and during half the years Chessman spent there. Then he went to the Supreme Court to serve while Chessman submitted his appeals. Warren fascinates me for a very different reason. Probably his crowning achievement was writing the Court’s decision in Brown v. Board of Education of Topeka. He also wrote Miranda v. Arizona and had a hand in Gideon v. Wainwright, two cases I make mention of in Friday 10:03 . These were all dramatic advances for civil rights in our country. But Warren had also been a key figure in one of the worst civil rights miscarriages in our nation’s history. Certain business elements in California and out-and-out racists had been trying for many years to get rid of Japanese competition. When World War II broke out, Earl Warren (then Attorney General of California) served their interests by leading the effort to have the Japanese interned in relocation camps. In his autobiography he admitted that was a mistake. I have always wondered about the degree to which Warren’s regrets about his failures over Japanese relocation led to his civil rights boldness on the Supreme Court. Fresh in our memory at the time was the commission led by Warren into the assassination of JFK, thought by many to be one of the biggest coverups in history. There is no Earl Warren character in Friday 10:03 . But don’t be surprised if he shows up in a later novel. Back stage at the banquet, five or six of us waiters stood around with Earl Warren. We chitchatted. No one asked a serious question. I first saw this over at Athol Dickson's blog. It's an animated video put together by XVIVO, a scientific animation company, for the Life Sciences department at Harvard University. Called The Inner Life of a Cell, it's a segment from an eight-minute representation at the molecular level on how white blood cells sense and respond to their surroundings and external stimuli. The only distortion introduced in the animation was creating extra distance between objects because ordinarily this would all be happening in such a compact environment that visual representation would be impossible. But apparently, this process, and billions more just like it, came about through a series of accidents and mutations, starting with inanimate matter that in turn cooled from the explosion of nothing, and without any guiding hand. Amazing. One benefit of raising five children is that as they each venture in directions I have never gone, I am the richer for it. For example, my computer-tech sons keep me up-and-running and challenge me to stay current. My two children who have married Brazilians have introduced me to a wonderful country (and a language) I had hitherto pretty much ignored. (Now, my quasi-citizenship-by-inlawhood is turning to China, though that country has long fascinated me.) My daughter who has focused on Peace Studies and solutions for domestic violence has challenged me in that direction. The daughter who has been working with a ministry to the differently-abled is now beginning a masters degree in Spiritual Formation and Leadership. Two of my children have chosen liturgical churches far different from the Evangelical tradition in which I raised them. Etc. This last item became important to me this week as I worked on my novel. In discussing literary genres, the imaginary line between ‘Historical’ and ‘Contemporary’ falls somewhere around 1950. At the time I began my novel, it was plainly Contemporary. Forty years later as I strive to finish it, I’ve come to consider 1966 as Historical. About ten days ago, I decided to include a cameo appearance by James Pike, then the controversial Episcopal Bishop of California. I turned to my Cognitive Ethno-Fashionologist son, who happens also to have ambitions toward the Episcopal priesthood, and we have studied photographs of Bishop Pike and the fashion choices then available to an Episcopal bishop. I have learned far more than I could ever use in a cameo appearance, but it has been a marvelous opportunity to go back in history and visit another world with my son as tour-guide. I think readers will also enjoy the cameo. Today I reached 60,000 words in my novel. That's about 220 pages of manuscript. Averaged over the 37 years since I put the first words on paper, that comes out to about 4.44 words per day. Wow! That means I completed 38 weeks worth of writing, just since I got out of bed this morning. No wonder I'm tired! Somewhere in a box, I have the first written pages of what has become my novel, Friday 10:03. When I came upon them a few years ago, it surprised because they were in teleplay form and I couldn’t remember ever writing anything as a script. It was in the typeface of the electric typewriter I bought in 1970 before beginning my rewrite for Of Runners and Poets, and which I lost in a burglary sixteen years later. I can only suppose when I might have written it. I’m guessing final exams week for UCLA's Winter Quarter, and then Easter vacation, 1971. Somehow, during the pressure and stimulation of final exams, I invariably got the inspiration for some great story, and rather than studying for my exams, I wrote. It had been an awkward Winter for me. 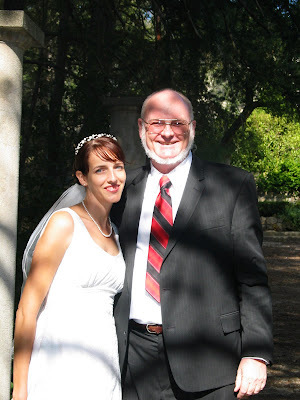 I had come away from Thanksgiving thinking I had an understanding with a young lady that we would eventually be married. She seemed not to have had the same understanding. In fact, I did not hear from her during December, nor most of January. I made so many trips to my empty mailbox, however, that I began to notice the person sorting mail into the boxes from the other side. Then, during the Easter holidays, I took this new girl to the beach for a day. We sat at the end of the runway at LAX, with jets taking off over our heads, and I shared what I had written. She liked it. To my astonishment, she gave me the same look in the eye that I had only seen from a girl once before, and that when I thought I’d been getting a life-commitment from the previous young lady. I went home scratching my head in wonder. And I’m still scratching my head in wonder, because Vicki and I have now been married for 34 years, and she has been invested in seeing this novel through to completion since that first day at the beach. No new post today on the history of my novel. but I had a good day writing on the novel itself. 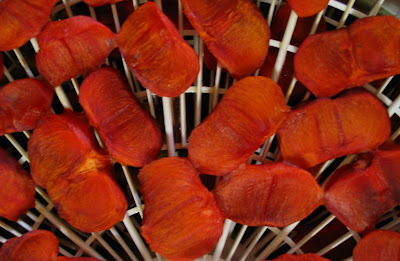 I'm also drying the last of this fall's persimmons. The whole house smells good. Almost ready to begin writing, but not quite . . .
During the summer (1970) between community college and UCLA, I rewrote the novel from the previous summer, and made a difficult—but what turned out to be momentous—decision. If Friday 10:03 is my first novel, then Of Runners and Poets would be my pre-first novel. Like in 1969, I organized my summer weeks into four twelve-hour writing days, alternated with three days of part-time-job, chores, errands, and having-a-life. I wrote in the bedroom I shared with a brother, a detached room behind my parents’ house. We called it the Hilton. While ordinarily, I live life on the run, with possessions and projects accumulating in great, shifting pile-a-mons, now, before I could write, I sorted and organized everything I owned. I constructed a large desk from a scavenged door and my filing cabinets, and I traded in my manual typewriter for a new electric one. The previous summer, each twelve hour day of typing had left my fingers bruised and swollen. On days I wasn’t writing, much of my energy went into helping a middle-aged fellow named Pat. Pat had emphysema, and needed an oxygen tank by his side. Yet Pat hoped to spend whatever time he had left traveling in Europe. He ‘hired’ me (I never actually saw a paycheck) as a Man Friday to accompany him. He would pay all my expenses and $200/mo. I would stay with him until he died. Then I would accompany the body back to the States. I desperately wanted to see Europe. We spent the summer getting my passport and getting organized. He was expecting a payout from a lawsuit against the Air Force, but progress seemed slow. He was in frequent contact with Sen. Cranston’s office, and made cryptic references to favors the senator owed him. But May became June, and then July, and as the summer ended, I had to make a decision. The UCLA quarter started at the end of August. If this trip to Europe was just Pat’s pipe-dream, I needed to be in school. Among other things, if I dropped out of college, I became draft-bait. Rather than Europe, I might be touring Vietnam. I laid it out for Pat. “No problem,” he said as he reached for the telephone. He dialed Sen. Cranston’s office, commenting that this was an opportunity to collect on one of those favors. Cranston wasn’t available. I had a night to go home and think it through. I wanted to go to Europe, and did not want to go to Vietnam. However, this was not how I wanted to escape the draft. I also had softly-nagging questions about the morality of the friends he talked about in Europe. What if I got over there as his ‘bond-slave’ and found myself in an underworld milieu? I told Pat he would have to find someone else. I was going to UCLA. Thirty-eight years later, I look back and shudder at how close I came to disaster. Had I gone to Europe with Pat, I would be a completely different person today—if I was even alive to recount it. Before moving on to the period when I started, wrote 120 pages of my novel, and decided to set it aside for 35 years, I need to mention three teachers. I mentioned in part two that from a 7th grade creative writing class, I gained a best friend and critique partner. For the next ten years, we took most of the same English classes and wrote together for various school newspapers. Outside of class, when Steve discovered Faulkner and Celine, I read Faulkner and Celine. When he bought Bob Dylan, Van Morrison, Leonard Cohen, and Randy Newman, we’d go to his house to listen to them. He’d read what I’d written, and pinpoint the key facet I had missed. I’d read what he’d written and think, “I’m not sure what this means, but it’s brilliant.” Ten books later, I still see reviewers say, “I’m not sure what this means, but it’s brilliant.” Steve actually suggested that my talents ran more to poetry than the novel. He also said that, unlike him, I would end up a teacher, because I lacked the drive necessary to be a novelist. I recognized he would be a novelist, but I thought he should also be an editor and a teacher. Forty years later, I have been a teacher, though I’m back again to the writing. Steve has earned great respect for his novels, but is also recognized as a book, film, and music critic, and has written occasional political commentary. But I’m pleased that he has also become an editor and a teacher. He founded and edits Black Clock, the literary journal at California Institute of the Arts, where he teaches in the MFA writing program. At Granada Hills High School, Steve and I took Advanced Composition from Martin Kaufman. Mr. Kaufman taught me how words make sentences, sentences make paragraphs, and ideas must appear on the page in logical sequences. As a teacher, he also set a standard that I have attempted to emulate, but always fallen short. After high school, while I went to community college, Steve went ahead of me to UCLA. There he began to study creative writing under Bernard Wolfe. I joined him in 1970. I can’t even recognize Bernie in the web bios I can find. As I remember his story, he graduated from Yale with a linguistics degree in the early 1930’s, when there wasn’t much of a market for linguists. He fought in the Spanish Civil War, knew (but didn’t particularly respect) Hemmingway in Paris and Havana, and was sent to Mexico by the American Communist Party to help Trotsky translate his memoirs (and serve as a body guard while he was there). After Trotsky was assassinated, Bernie turned the experience into The Great Prince Died. Later he wrote a pioneering Sci-Fi novel, Limbo. He wrote a lot for Hollywood, and he was a great creative writing teacher. I loved to workshop a story—mine, Steve’s, somebody else’s—with Bernie in the room. With these introductions out of the way, it is almost time to start writing a novel. Winter has not yet brought enough cold weather to knock the last leaves from our back yard oak tree (Quercus lobata), but already the weeds think it is spring. 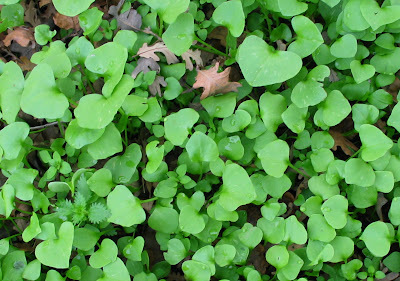 The young Miner’s Lettuce (Montia perfoliata) would be unrecognizable for someone familiar only with the very different leaf of its adulthood. The smaller ones are almost indistinguishable from the Chickweed (Stellaria media). The Stinging Nettle (Urtica dioica) thinks it can hide from me. I’ll try to pull it soon, before it spreads to the whole yard. The Miner’s Lettuce already has most of the back yard, but I like it. I only try to keep it from spreading to the neighbors’. Although justice, redemption, prisons, and the death penalty helped launch the musings that became Friday 10:03, several other themes animated my thinking, as well. In 1962, my aunt and uncle returned from two years in the Congo, and my aunt worked her way up to be International President of Laubach Literacy, overseeing adult literacy programs in sixty countries. We began to have African and South East Asian guests at our holiday gatherings. I began to take French. I became fascinated by the United States-as-melting-pot, just as that theory was about to fall out of fashion and be replaced with the U.S.-as-salad-bowl. In high school, I wrote a poem, “O’Henry’s Chinese Diner/Serves pizza on the go./Mrs. Schwartz, the hula dancer/Brings crowds to see the show.” A reader who looked at my murder mystery commented, “The cast of characters reads like roll call at the United Nations.” It’s still a tendency I have to consciously tone down. But it is also true to the life I have lived. Majoring in history, I became interested in migrations of people, and how conflicts or adaptations occurred when cultures bumped up against each other. I read a lot of Carey McWilliams, who wrote during the 1930’s and 40’s about non-English-speaking immigrants and race relations in California. For a ‘History of Mexico’ class, I researched Japanese and Chinese immigration into Mexico. For ‘History of South America’, I wrote on Japanese living in Peru and Brazil. 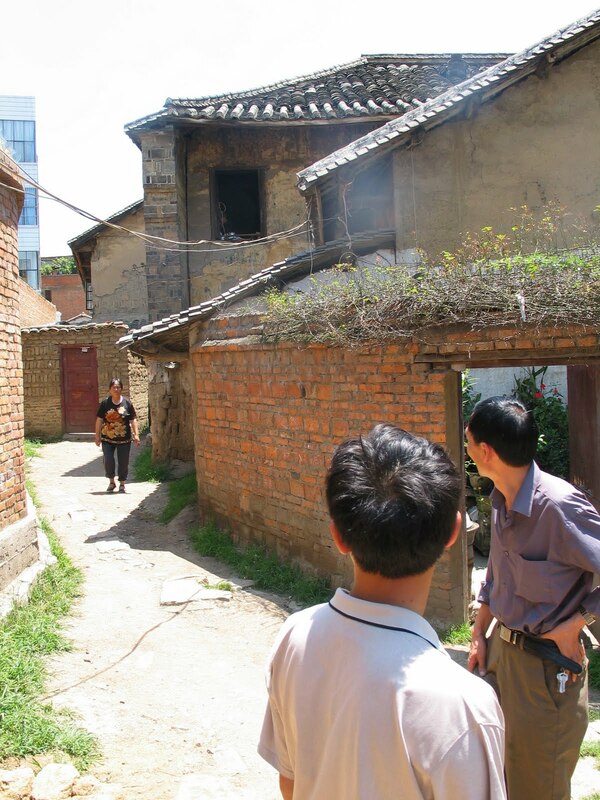 As a series of independent study projects, I wrote what was then the longest treatment in the English Language on the communities of Chinese living in Europe. I took a year of Japanese, and volunteered as an English tutor for new arrivals in Chinatown. What makes for successful immigration? What are its pitfalls? In what ways do identities change during immigration? What forces impede those changes? And to bringing this back to Friday 10:03 and my other thinking: How often do our prisons serve as dust bins for the shards of immigration failures? A fair question would be to ask what first attracted me to the story of Caryl Chessman. Much later, I spoke with someone who had known him in prison and considered him “pure evil.” Others report his brilliance and charm. That’s not really contradictory, because the most dangerous evil comes packaged with charm. What seems certain is that he was one of those individuals who actually do better in prison than outside. Inside for most of his adult life, he could never stay outside for long. Yet once he was back in, he rose to positions of trust. As a jailhouse lawyer, he may never be excelled. I saw questions about redemption, and where its thresholds might be. Out of prison, Chessman supported himself on hold-ups, but was never suspected of murder. He was executed for a kidnapping he may never have committed. I saw questions of justice, and how a society could pursue it. Then, as I mulled a possible character from the Chessman story, I began to wonder: What would happen if—instead of my character becoming a jailhouse lawyer—he became a jailhouse guru, writing books that developed a spiritual following? In my own life, I was trying to sort through the questions—or even the existence—of religious truth, for which my character could be a vehicle. My story still had 40 years to shift and sprout new directions, but this is the ground from which it grew. In the meantime, during the second summer after my high school graduation, I wrote a different novel, a murder mystery in the context of Vietnam Era draft evasion. The following summer, I rewrote it. Then I transferred from community college to UCLA and entered my novel in a UCLA student novel contest. My 512 page manuscript lost to a 30 page first chapter from a novel that never would reach page 100. I had to turn twenty-one without my Pulitzer, but I was learning valuable lessons about the writing life. With the wedding and honeymoon over, this week my daughter and my new son-in-law are visiting with us before they return to their home in Brazil. He is working on his English, and I am slowly picking up a little Portuguese. For example, I am now his sogro, and he is now my genro, except that the ‘r’ is pronounced like an ‘h’, and the initial ‘g’ is pronounced like a ‘zh’. So far, meu genro has put up with a lot of strange things from seu sogro, but yesterday his curiosity reached a threshold. 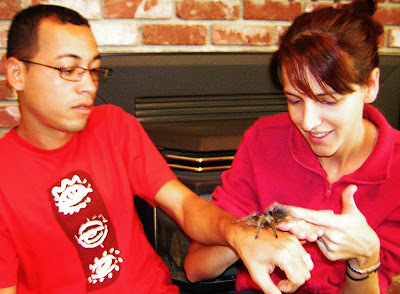 What good—he wondered—is a pet tarantula that hardly ever moves? Well, on one level, Farrah is a holdover pet from my last classroom, as is Piume the Red-Eared Slider, who was originally my daughter’s before she moved to Brazil. On another level, Farrah is a living pun. Tarantulas make up the family Theraphosidae, and the common California tarantula is Theraphosa aphonopelma. Theraphosa sounds so much like Farrah Fawcett, and both are covered by such beautiful hair, that for a pun lover like myself, Farrah can move at glacial speed around her cage and still be worth every cricket or beetle I toss her. However, for the benefit of meu genro, we brought Farrah out for a walk. At this point, I think he was quite satisfied with her glacial speed. For a 16 or 17 year-old trying to figure out pure religion, this was a quantifiable test. As a 58 year-old, I can say I have been inside San Quentin twice for the purpose of visiting a Death Row prisoner, but I would have to admit my motives were not purely religious. Yet as a teen-ager trying to distill the essence of pure religion, this seemed to be one of the tests. I grew up in a series of Methodist churches where I learned the importance of practical service. These were good people, doing good things, singing good music, and sharing good meals. My sense, though, was that they treated the Bible as a convenient mythology for holding a good group of people together. At the same time, my own reading of the Bible told me that its interior logic forbid such a treatment. Either it is true—in all of its statements of deity, eternity, Heaven, and Hell—or it is not. Where was the bedrock? On a “Youth Sunday” at age 14, I was invited to present the Sunday morning sermon. I thought I had pushed the envelope rather daringly, but got only polite congratulations. My eight-dollar short story for the denominational Sunday school magazine was the retelling of a Buddhist parable. In looking for bedrock, I found none at all. At this point in the story, the 40 year clock on writing my novel hadn’t even started ticking. I wasn’t even a writer. When Caryl Chessman made the cover of TIME, I’d probably only been a serious reader for about two years. However, I was devouring biographies, TIME magazine, and grown-up fiction in The Saturday Evening Post. In a sixth grade class production, I experienced that magical moment of seeing my name in print over something I’d written. It hooked me. I was a writer. My father offered me a deal: If I would teach myself to type over the summer vacation, he would let me take creative writing as my elective in 7th Grade. From that class, I gained my chilhood best friend/critique partner. In 8th grade, I held a check in my hands, eight dollars for a short story sold to Three/Four, a Methodist Sunday School handout. Writing for the junior high newspaper, I finagled an interview with New York Governor Nelson Rockefeller, then a candidate for President. By twenty, I would certainly have a Pulitzer, by twenty-five, perhaps my Nobel. Somehow, though, in place of the Pulitzer, I had to settle for second place in the short story contest of a national teen magazine. Then, about 1966 or 1967, I read the books by Caryl Chessman, all three of them. Today’s milestone: David Anthony Durham, chairman of my thesis committee, emailed to say he had received the first 212 pages of my novel, and will begin working on it. David was new this semester to the CSU Fresno faculty, so I wasn’t able to take any of my coursework with him, but I am excited about working with him one-on-one. His new novel, Acacia, his first effort in fantasy, has won numerous year-end-recognitions. As time allows, I’ve been enjoying his previous book, Pride of Carthage, about Hannibal. How does it take 40 years to write a novel? Recently, I saw another author’s ten-year saga of getting her book published. I haven’t even begun the publishing part yet. For the writing task, though, I’m beginning to see the light at the end of the tunnel. I’m working toward a deadline in mid February for giving it to my thesis committee, and one in mid March to show it around at a writers’ conference. Over the years, many people have asked what it was about, or if I was getting finished, or any number of polite questions when the real question concerned whether there really was a novel in all that talk. There’s a story in that, and at a little bit each day, it might take almost until mid March to tell the story. I will begin it here. First though, I must point out that Friday, 10:03 is a working title. Much as I like it, I will probably have to come up with something else in order to sell the book. Publishers have rules against numbers in titles, and Friday, 10:03 presents some additional problems. How should you read the time? Three minutes past ten? I have always said it, “Ten-o-three.” The colon presents its own problems—no file name will accept it. The comma in a blog label would be read as dividing it into two labels. So the title will have to change, but I don’t have a replacement for it yet. For the moment, this work-in-progress is still titled, Friday, 10:03. Next, I must distinguish between when I first put words on paper with the characters and story that has evolved into Friday, 10:03, and the earlier time when the jumbled thoughts and questions first began to bubble inside my brain. The writing must have started in late 1970 or early 1971. I know that on our first date, I showed an rough sketch to the woman who eventually became my wife. That would have been Easter, 1970. However, the percolation had begun a full ten years earlier. By May 2, 1960, when the State of California executed Caryl Chessman, he’d been on San Quentin’s Death Row for twelve years. He'd he’d written three books, made the cover of TIME magazine, and become such a cause-célèbre that the State Department asked California to postpone the execution so that Eisenhower could tour South America without being mobbed. 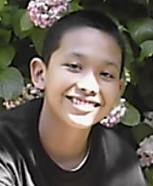 I was ten. I read the TIME magazine cover story. Then, for another ten years, I mulled. 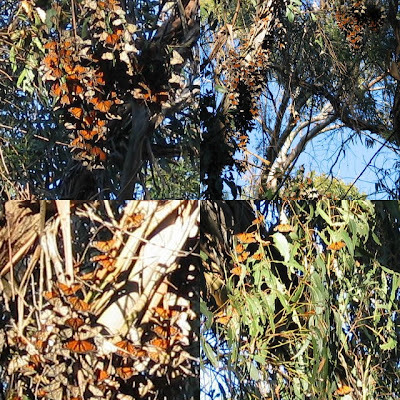 Once the wedding festivities were over, I would have had to forfeit my Amateur Entomologist's license if I didn't take the short trip down Hollister Ave. to Ellwood Beach and witness the annual return of the Monarch Butterflies. There, my license is good for a few more weeks, at least. In my recent redesign of this blog, I was reminded that when I first set it up, I set it for comments by members only (its purpose being contact with the English students I had taught in China). However, they couldn't comment because the blog couldn't be seen beyond the Great Chinese Firewall. Since I quickly forgot how I'd set it up, I often wondered why I wasn't getting any comments at all, not even from my wife or kids. Now, however, I have reset things, and this author blog is open for comments. Unless I still haven't figured this out. Where other babies I have known cuddled in when you held them, First Daughter liked to lean away, independent from the get-go. From her father, she got a love of travel. From her mother she got girls-can-too. From her faith she got the recognition that the poor deserve dignity. I fought back tears as we started down the aisle together, not because I was giving her away, but because God has blessed me so very richly in having her. Sometime between our Thanksgiving and Christmas visits, my grandson gained the ability to use morphologically recognizable English. (His parents often use Portuguese, as well, but if the kid’s using it, I wouldn’t recognize it.) As he tried to pet the elderly and remarkably patient Psychokitty, Nato plainly repeated, “ca(t).” Then he vroomed the wooden car that first belonged to his uncle, and said, “ca(r),” managing to get the subtle difference in the vowels. Thus, he is beginning with nouns, as did his father, thirty years ago, poking his finger against the aquarium to say, “fi(sh),” and watching the pooch go by and saying, “do(g).” The auntie, whom I walked down the aisle last Saturday, and the linguist uncle who took off for China immediately after the wedding, both began with directionals, she standing at my feet to say, “Up,” and he at the front door to run together as one word, “Go ou(t).” Nato is also using sign language. In the parking lot the morning after the wedding, he patted his head to say he wanted to wear my hat. My grandson and I have begun our conversation.